X Cylinder, Sunflowers, Orange Lilies, Lavender Stock, Dark Pink Roses, Green Buttons, Orange Alstroemeria, Variegated Pittosporum. Cinnamon Roses, Blue Delphinium, Green Carnations Or Green Buttons, White Daisies, White Montecasino Aster, Salal Or Variegated Pittosporum, Gathering Vase, Raffia Tie. Just a little orange and a little blue go a long way in the heart of a Gator. 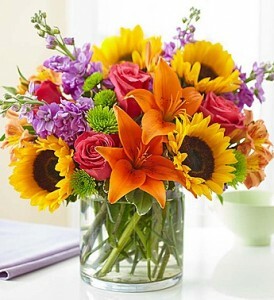 Make their day with Fresh blooms from Prange's Florist! 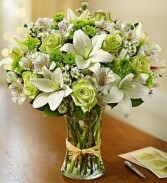 Asiatic Lilies White, Green Carnations, Green Or White Roses, White Or Green Alstromeria, Green Athos Mum, White Montecasino Sprigs, Salal, Gathering Vase. Our Serene Green arrangement is hand-designed with the freshest blooms in shades of green and white and arranged in a classic gathering vase tied with raffia. 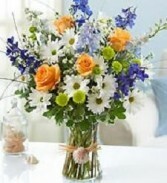 This peaceful design will have them reflecting on your thoughtfulness.